Boston 1775: Who Said, "Don't Fire Till You See the Whites of Their Eyes"? "We Have Peppered 'em Well"
Bunker Hill "By Some Mistake"? What Do We Call the Battle of Bunker Hill? Was Dr. Samuel Danforth Smuggling Hay? Where Was Paul Revere's "North Church"? William Molineux: a Wolverhampton wanderer? Who Said, "Don't Fire Till You See the Whites of Their Eyes"? The Battle of Bunker Hill yielded one of those quotations that every American is supposed to know: “Don’t fire till you see the whites of their eyes!” Meaning, “Don’t use any of your gunpowder until they’re really, really close, so you won’t miss.” But it’s still debatable which American officer said this, if anyone. Some sources credit Gen. Israel Putnam of Connecticut, some Col. William Prescott of Massachusetts. In 1788 David Humphreys published an Essay on the Life of the Honourable Major General Israel Putnam. I haven’t rustled up that edition, but I found an 1818 printing through Microsoft’s Live Search, and it did not contain the “whites of their eyes” quotation. That leads me to think the original didn’t have it, either. Don’t throw away a single shot, my brave fellows; . . . don’t throw away a single shot, but take good aim; nor touch a trigger, till you can see the whites of their eyes. As with his legends of Washington and the cherry tree and Washington praying in the snow at Valley Forge, Weems gave no source for this anecdote. He wasn’t a scholarly writer, and (unlike Humphreys) he didn’t know his subjects personally. But Weems’s biography was immensely popular in the early republic, and helped form the public understanding of Bunker Hill. Powder was scarce and must not be wasted. They should not fire at the enemy till they saw the white of their eyes, and then fire low, take aim at their waistbands. They were all marksmen, and could kill a squirrel at a hundred yards; reserve their fire, and the enemy were all destroyed. Aim at the handsome coats, pick off the commanders. 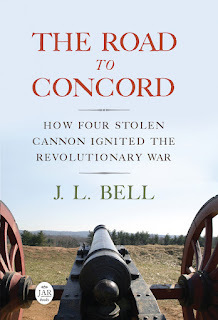 This book then goes on to say, “The same orders were reiterated by Prescott at the redoubt, by Pomeroy, Stark, and all the veteran officers.” In other words, every top officer was giving the same orders, but Putnam gave them first. That version of Putnam’s words, and the sentence that followed, came straight out of Samuel Swett’s History of Bunker Hill Battle, published first in 1818 and reissued in 1826. Swett’s appendix quoted the testimony of three men who said they had been in the battle: John Stevens of Frye’s regiment, Philip Johnson of Little’s regiment, and Elijah Jourdan. All said they heard Putnam speak about the “whites of their eyes” or heard other officers say those orders came from Putnam. Swett and other New England historians saw such a sequence of orders as highly significant because, as the fiftieth anniversary of the battle approached, they had drowned themselves in ink debating who was in command of the provincial forces. Was it Putnam, Connecticut’s general and hero? Col. Prescott, in the redoubt? Gen. Seth Pomeroy, who was in the ranks as a volunteer? 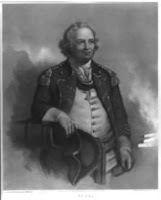 Dr. Joseph Warren, who had also been commissioned a general and was also in the ranks as a volunteer? The good thing about this debate is that it spurred writers to find veterans of the battle and put their recollections into print. The bad thing is that so many of those sources were focused on boosting the case for a particular candidate for command rather than providing a complete picture of the action. Furthermore, if lots of officers were saying the same thing, it would be almost impossible for a soldier in one part of the line to know who said it first. Finally, all those reminiscences went into print after Weems’s book, raising the possibility that his popular tale had affected how men recollected or recounted their experiences forty years before. Richard Frothingham’s History of the Siege of Boston, first published in 1849, attributed a variety of phrases to a variety of officers. “These phrases occur frequently in the depositions [of veterans], the same one often being ascribed to different officers.” Frothingham did cite Johnson saying Putnam had voiced the “white of their eyes” remark. However, since he concluded that Prescott did the most commanding during the battle, his book led many later writers to credit the colonel with the famous quotation, not Gen. Putnam. The best Boston 1775 guess? I think the weight of the evidence favors Putnam (shown above) with the “whites of their eyes” phrase, even if Prescott was doing more in the redoubt to make provincial soldiers hold their fire. But that doesn’t mean Putnam coined the phrase. TOMORROW: The real source of the quotation? Your last line: "But that doesn’t mean Putnam coined the phrase."... is it a typo? Did you mean to write Prescott? Or, simply put, who is your guess as to who said it? Put or Prescott? No, I meant that Putnam seems a little more likely to have said the words in Charlestown on 17 June 1775 than Prescott—but neither man appears to have coined the phrase, as my follow-up posting discussed. It’s possible that American officers in Charlestown were repeating an established order borrowed from the German. And it’s possible that early historians put that phrase into those American officers’ mouths. "Major [Amos] Farnsworth also made the same statement to his daughter that we get from other sources, viz, That when Colonel Prescott was leaving the field he met General Putnam, and asked him why he did not come up and support him, to which the General replied that he 'could not drive the dogs along;' and Colonel Prescott said, 'You should have led them, General.'" -- Francis Marion Boutwell, recounting an interview with Miss Elizabeth Farnsworth (October 10, 1880), daughter of the quoted Major Amos Farnsworth, as reported in the book “People and Their Homes in Groton, Massachusetts, in Olden Time,” published in 1890. This is the most popular posting on Boston 1775, or at least the one that gets the most hits—probably because its title matches a common test or trivia question. So i feel I should include a link to my more recent findings on that question. I have read Frothingham's stuff a while back, but don't remember the specifics of this. However, I don't believe, as is mentioned as a remote possibility in your post, that it would have been Warren. My impression was that although he had been commissioned a General, when offered command he refused it citing his inexperience, and continued as a volunteer. My guess is that he was not in any command, but by personality and natural leadership gave a lot of support. Always wonder what would have happened had he lived. There was a vogue in the mid-1800s to credit Dr. Warren with being the senior American officer at the battle and thus the man in charge. That gave way to a more romantic picture, as well as one better supported by the evidence, that he insisted on fighting in the ranks. That's a different question from whether he voiced the "Don't fire…" line, which is usually attributed to Putnam, Prescott, or no one. My more recent postings on the question, linked above, found earlier and more reliable evidence that Putnam said the famous line, and that it was already well known in a branch of the British military.